Kinkasan Koganeyama Shrine in northern Japan is thought to bring monetary fortune to visitors. The area is beautiful, nature is abundant, and deer here outnumber the residents here. Spend the night at the shrine for an incredible experience. Kinkasan Koganeyama Shrine – Improve Your Luck with Money! Kinkasan Koganeyama Shrine (Koganeyama Shrine) is a spot that is believed to bring economic fortune. In fact, it is said that if you visit the shrine for three consecutive years, you will not have to worry about money for the rest of your life. This shrine was established to celebrate the first gold production in Japan in Miyagi Prefecture. Koganeyama Shrine is a prominent shrine and has received donations from powerful authorities in Japan since the Heian period. The island it is on has been visited by many mountain ascetics and is revered as sacred. The shrine is famous for being one of Japan’s Five Great Benzaiten Shrines (*1) alongside Enoshima Shrine and Itsukushima Shrine. It is said that visitors in the past often stayed overnight in the lodging on the shrine grounds. Worshipers now often make a day trip to the shrine. However, we recommend visitors stay the night to experience traditional shrine rituals and relish a peaceful, quiet evening. *1 Japan’s Five Great Benzaiten Shrines: a shrine that worships Benzaiten, one of the Seven Lucky Gods. These five shrines are Koganeyama Shrine (Miyagi Prefecture), Enoshima Shrine (Kanagawa Prefecture), Itsukushima Shrine (Hiroshima Prefecture), Tsukubusuma Shrine (Shiga Prefecture), and Tenkawa Shrine (Nara Prefecture). 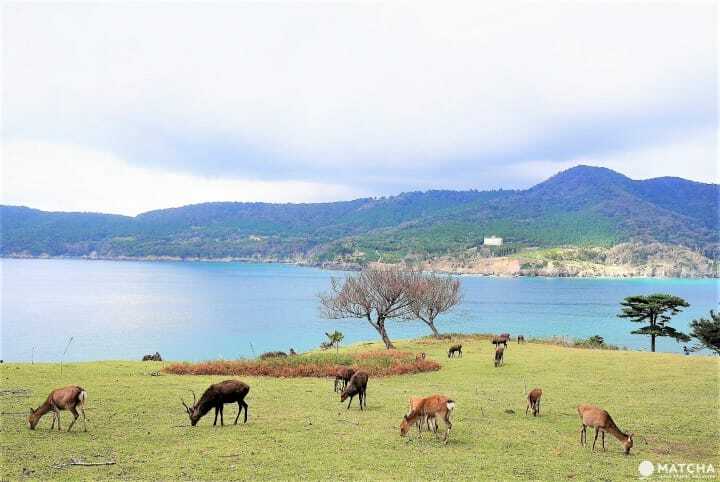 Kinkasan Island – Where Deer Outnumber Humans! Kinkasan Island, where Koganeyama Shrine is located, is a small isolated island in Ishinomaki, Miyagi in the Tohoku region. It takes about one hour riding east by train from Sendai to reach Ishinomaki. You will then have to use a bus from Ishinomaki Station to the port, and then ride the ferry to Koganeyama. Upon arriving at the island, you’ll be surprised by the sheer number of deer! The residents of the island are just a few people who work at the shrine. Up to 500 wild deer inhabit the island. The deer are protected as messengers of the gods. There are also said to be around 250 monkeys on the island, but they are rarely seen as they keep away from humans. Many visitors will want to approach the deer as they are so adorable, but be aware that the males during the breeding season (September-November) and females during their birthing and rearing period (May–July) are prone to become violent. Nonetheless, they are typically docile creatures that will warm your heart as you watch them leisurely eat their food. There are eight shrines, including Koganeyama Shrine, on the island. As the shrines are located in the mountains, this is an area where visitors can feel the immense natural energy from the natural surroundings, large trees, and flowing spring water. This is an ideal destination to relax and recharge your energy here. This is Kinkasan Benzaiten’s coin washing area, where water flows from the mouth of a dragon statue. It is said that your fortune will increase by placing your coins in the draining basket shown above, then placing them into your wallet after washing them. There is no connection to public water service at Koganeyama Shrine. However, spring water from Mt. Kinka, abundant with minerals and naturally filtered is used for the shrine. There is also a shrine deifying the god of water which we also suggest visiting. Near the coin washing area is a gorgeously landscaped area. Owadatsumi Shrine Yohaijo was established to honor the god of the ocean enshrined on the summit of Mt. Kinka. It takes around one hour hiking from Yohaijo to the summit, so visitors without much time are recommended to make a prayer here instead. There are several enormous and impressive trees on the shrine grounds. The Double Pine Maple Tree is a pine tree and maple tree intertwined together into one tree, as its name suggests. The powerful meeting of two different species of trees is very pretty and visually impactful. The tree pictured to the right is a sacred 800-year old tree and is said to be inhabited by the gods. The trunk has been split open and is big enough to snugly fit a person. Other massive trees with large, uneven trunks, such as the Machilus thunbergii trees (pictured on the left), tower over various areas of the shrine. It is easy to feel the great power of nature surrounding you from these majestic trees. Visitors are only allowed inside the Main Hall, where the gods are enshrined, for three weeks out of the year. These three weeks occur during the Hatsumi Grand Festival, an event in May, from January 1 to 7 for the Nanacho Festival, and during the Lunar New Year (*2) for the Lunar New Year Nanacho Festival. Visitors are usually able to make their prayers through the worship hall. After climbing up a nearly 100-step staircase, you will arrive at the worship hall. In 2019, the Hatsumi Grand Festival will be held from May 8 to the 14. These dates vary by year. *2 Lunar New Year: the New Year according to the lunar (lunisolar) calendar. It changes every year and usually occurs from around the end of January until mid-February. One thing about the shrine distinct from other shrines is that five and 50 yen coins are fastened on the cords of the bells rung at the shrine. In the past, visitors began tying coins onto the cords, which resulted in the bell being pulled down from the weight of the coins by the end of the year. The cords are now replaced once a year. The worship and main hall, built by expert carpenters during the Meiji period, are considerably durable than modern structures. During the Tohoku earthquake of 2011, this was the only area that did not receive any damage at all. Make sure to thoroughly observe the state of the wooden framework of the pillars and roofs. Near the shrine is a mountain trail that leads to the water shrine and Owadatsumi Shrine on the mountain summit, which takes around one hour. There will be areas where you will have to walk up steep slopes and on top of boulders, so please only make this hike if you’re in shape while wearing the appropriate sneakers or trekking shoes. From the summit, you can gaze out onto the breathtaking scenery of the surroundings and the Pacific Ocean. On cloudy days, the area has an ethereal atmosphere. On sunny days, the blue ocean and sky are also extremely beautiful. Climb up the following morning of your stay here to start off the day feeling great. One precaution is to not go further than the summit. The road has collapsed due to the effects of the 2011 earthquake. Once you’ve arrived at the summit, return using the road that you came from. The Sanshuden (Gathering Building) is a lodging facility for visitors located on the shrine premises. We recommend lodging here for a night to have a unique, unforgettable experience at Koganeyama Shrine. For a one night and two days stay at the shrine, visit the shrine after arriving around noon and take a dip in the spring water baths between 16:00-18:00. In the evening, eat a meal made with freshly-caught fish from the area, then spend the night quietly. Starting around 6:30–7:30 the following morning, you can experience a Shinto ritual called Ichiban O-Gomakito. The time of this morning ritual will change depending on the season. Please confirm the details with the shrine employees during your stay. O-Gomakito is a ritual where gomaki (prayer sticks, pictured), written with the wishes of worshippers, are burned in prayer. Goma (homa) was originally a Buddhist ritual, but is a remainder of the shinbutsu shugo (*3) from before the Meiji period. This is a rare ritual for a shrine. *3 Shinbutsu Shugo: an occurrence that merged Shinto and Buddhism into one religion before the Meiji period. The shrine maidens will present (*4) a dance to the gods. The smoke from the burning gomaki drifts into the air, increasing the mystical aspect of the scene even more. After the ritual is over, you will be offered a sip of a Japanese sake called omiki. It is a sacred sake said to hold the spiritual powers of gods. Lodging at the shrine, which includes breakfast, dinner, and the ritual, starts at 10,000 yen including tax. For details, please refer to their official website. If you will be joining the ritual on a day trip, you will pay around 5,000 yen or more. *4 Hono: the offering of objects or dances to the gods. The recommended time to lodge at the shrine is when they are holding events. Popular periods are during the last weekend of July when Jaodori Hono is held, or the first Sunday of October during the Shinroku Tsunogiri Festival. Jaodori Hono is an event where people wearing special outfits form a parade, bearing a 20-meter long dragon. Bells and flutes music is also played, making the event extremely special. October, when the Shinroku Tsunogiri Festival is held, is the breeding season of male deer. Fifteen deer will be taken from near the grounds and their antlers will be cut off to prevent any human injuries during this time. This is considered to be a serious event, similar to martial arts. Other various events are also held each month, so plan your trip while considering these events in order to have a special experience. It is necessary to check how you will get to the shrine beforehand, due to its location on an isolated island. Regular ferry service to the island is only available in 2018 on Sundays due to the effects of the earthquake. Head to the island from either Onagawa Port or Ayukawa Port in Ishinomaki. If you’ll be staying overnight, we recommend heading out to the island from Onagawa Port where the ferries are frequent on Saturdays. Afterward, go to Ayukawa Port on Sunday to sightsee Ishinomaki. Onagawa Port is serviced by ferries every Saturday as a special service. The timetable will vary on the day. On Sundays, only one ferry departs at 11:00. The ride will take about 35 minutes and will cost 1,550 yen. If doing a day trip, then be sure to depart from Kinkasan on the 13:30 ferry. Check the ferry’s official website (Japanese) for details or consult with the shrine when making your overnight reservation. The workers at the shrine will kindly provide you with support in simple English. Ferries service the port every Sunday. The ride takes about 20 minutes and costs 2,500 yen for a roundtrip ticket. The ferry departs from Ayukawa Port at 10:30 and from Kinkasan at 12:30. Phone reservations are required to ride during the regular service. If you are staying overnight and wish to take the ferry departing from Kinkasan, be sure to consult with the workers at the shrine. If you wish to visit the shrine on the weekdays, you will need to make arrangements for a water taxi, which will cost about 15,000 yen. Reservations must be made by phone and can only be made in Japanese, so it is best to utilize the ferries on the weekends. You can travel from Ayukawa Port to Ishinomaki Station by either ferry or bus. The afternoon bus departs at 13:22 and 16:21 (as of 2018) and is about a one hour and 20-minute ride. Ishinomaki is scattered with art installations of manga characters including a museum to Shotaro Ishinomori, a Japanese manga artist who created works such as “Kamen Rider.” Although the city suffered great damage from the 2011 earthquake, the area is recovering and new shops are being built. COMMON-SHIP Hashidori, about a ten-minute walk from the station, is an area of food stalls with an atmosphere reminiscent of traditional Japanese festivals. Here you can try classic Japanese foods like yakitori, kushiage (fried meat and vegetable skewers), and curry. Ishinomaki yakisoba, a B-rank cuisine, is a must-order item. It is a type of yakisoba flavored by steaming the noodles twice in a seafood dashi stock. Try it at Teppan Desu WHITE, a stall in COMMON-SHIP Hashidori, and enjoy it served with a special sauce. This area is also considered one of the world’s top three fishing spots, certifying the tastiness of the seafood here. You can eat seafood at Ishinomaki Genki Ichiba (Japanese) located nearby COMMON-SHIP Hashidori. Koganeyama Shrine has been visited as a sacred place by many people since long ago. Prior to the earthquake, several ferries departed each day as numerous shrine visitors came and went from the island. Shrine visitors have been limited due to the few ferry departures, but that is why this may be the ideal destination to spend a relaxing, peaceful time. How about making a trip to experience an unforgettable, extraordinary world? Japanese Religion: What's The Difference Between Temples And Shrines?